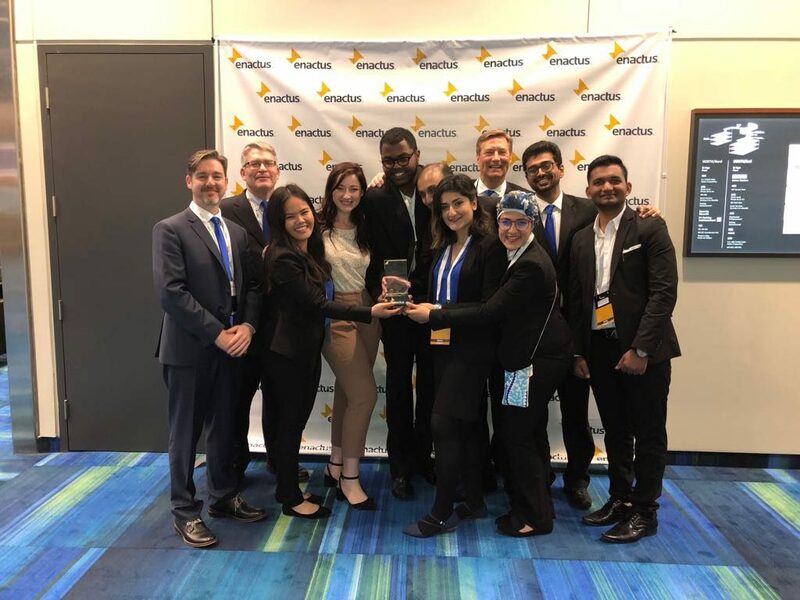 With 67 teams competing to represent Enactus Canada on a global scale, Enactus George Brown College were among the top 20 finalists at the 2018 Enactus Nationals Exposition! Over the course of the three-day event, post-secondary students across Canada showcased how their community outreach projects and business ventures enabled progress through entrepreneurial action. 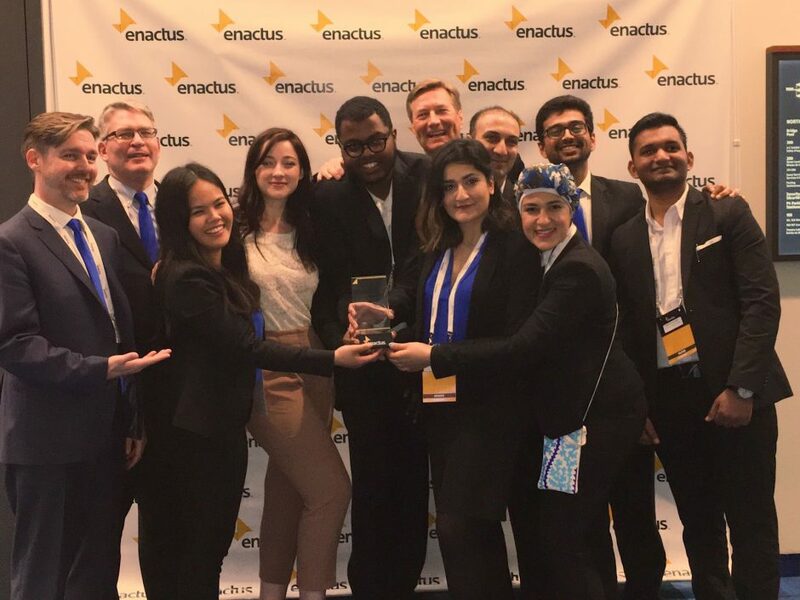 With 9 businesses created, 185 lives changed, and 8 sustainable goals met, Enactus GBC delivered empowerment projects throughout the school year to better shape the economic, social and environmental landscape of Canada. A few of those projects were Change Matters, a financial literacy lesson plan for Canadian youth; Girls Going Forward, a program that uses entrepreneurship as a catalyst to empower unemployed youth; and Spudlery, an eco-friendly line of cutlery made from potatoes skins to limit plastic waste. The Change Matters project set out to empower 217 participants through six customized lesson plans. Enactus GBC found that 75% of Ontario’s high school students were unsatisfied with the financial literacy curriculum currently taught in schools. More importantly, 735,595 youth in Canada were living in poverty and 14 million Canadians were living paycheque to paycheque. With Change Matters, youth were able to learn key fundamental financial principles to help build their confidence and financial prowess. Through the program, 19 of their participants reduced their debt in just six weeks, with 100% of their participants pursuing post-school education. The second project Enactus GBC presented was Girls Going Forward. Girls Going Forward was created to enable youth from low-income households to create their own businesses. Enactus GBC found that 14% of Canadian youth were currently unemployed, with Toronto youth being the highest in the country at 18%. Girls Going Forward provided a mentorship program for their participants to further develop their businesses, with the scope of the project expanding to combine STEM (Science, Technology, Engineering and Mathematics) and entrepreneurial elements. Through the program, 64 participants generated 8 unique businesses, with one participant raising $3,500 in funding towards her project. Finally, Spudlery set out to reduce plastic waste by creating eco-friendly cutlery from potato skins. With only 14% of plastic packaging being recycled and close to 165 million tonnes of plastic found in the ocean, Enactus GBC chose to find an environmentally conscious solution to this big problem. Although they are in the early stages of fine-tuning the development of this product, their short-term goals are to reduce 5% of plastic cutlery at George Brown College within one year, and sell their product directly to end-users in the next 8 months. A big congratulations to Enactus GBC for doing incredible things in the way of entrepreneurship! We are proud of all of your accomplishments and look forward to see what you have planned next year.